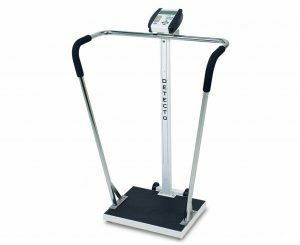 Designed for obese and unsteady patients, this 600lb capacity bariatric scale features a balanced, lightweight design. It’s easily tipped back for transportation on its hard, large diameter, rubber wheels, yet narrow enough to fit through 30″ doors. The battery-powered, LCD display rotates for easy readability. The low profile platform, convenient handrail and skid-proof mat add to patient assurance. Have additional questions about our Detecto scales or other products? Please contact us today to speak with our expert team.